Haruki Murakami fans, take heart. The next novel by the celebrated Japanese author is coming in April, according to an announcement released by publisher Bungeishunju on Saturday. The Diplomat contacted the publisher, who confirmed the book deal and April release for the Japanese version, but refused to divulge any other details. It’s been three years since Murakami’s last quirky tome, the 1,000-page 1Q84 (published by Shinchosha), took the literary world by storm. A play on George Orwell’s 1984 – with “kyu” being the Japanese pronunciation for the word “nine” – 1Q84 tells the stories of a female assassin Aomame and a man named Tengo who is ghost-writing a novel within the novel titled Air Chrysalis for a literary contest. A religious cult, a girl with powers of telekinesis, a mysterious dowager and much more come into play in this three-part story set against the backdrop of a fictionalized Tokyo circa 1984. On the day of its release, Japan’s largest bookstore Kinokuniya sold more than one copy per minute, according to the BBC. Keep in mind, this isn’t Harry Potter. For those who are be new to Murakami – though it would be hard to evade his reach – a playful, surreal quality infuses his fictional universe, which is populated by talking cats, psychic prostitutes and dancing dwarves in alternate universes and subterranean worlds. Almost everyone who likes Murakami says the same thing: They get lost in the worlds of his novels, yet somehow come through feeling illuminated in some vague way. It’s an interesting phenomenon. What gives the classic Murakami touch to these fantastic elements, though, is the way they are interwoven into “everyday life”. Cool-headed, bemused protagonists navigate the confusing boundary between waking life and dream, thrown into predicaments that are simple on the surface, but suggest layers of depth. In his 20s, Murakami operated a jazz bar with his wife called Peter Cat in suburban Tokyo. Memories of these years seem to drift effortlessly into much of his fiction, which is decidedly Western in its pop cultural references and overall style. Since debuting with Hear the Wind Sing in 1979, Murakami has gone on to write twelve novels and several collections of short stories, which have been translated into more than 40 languages. But he didn’t find his stride until he penned Norwegian Wood in 1987, which was later turned into a film by director Tran Anh Hung. Murakami began to find an international audience from the late 1990s, when translators Alfred Birnbaum, Jay Rubin and Philip Gabriel began to dip into his growing body of work, which includes The Wind-Up Bird Chronicle and Kafka on the Shore. In anticipation of his forthcoming novel, a look back at the response to 1Q84 gives a taste of things to come. 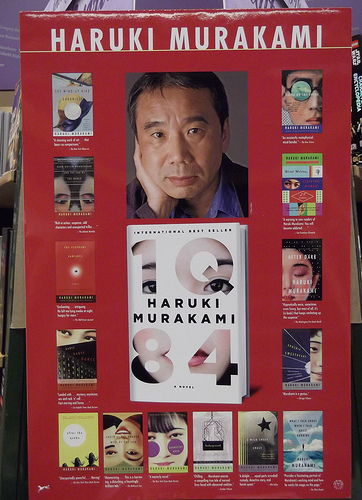 “Murakami is the only living writer who can sell a million copies in a month and still be in the running for the Nobel Prize,” Douglas Haddow wrote in a laudatory article titled “IQ84 is Proof that Literature Matters”, published in the Guardian in October 2011. Speculating on Murakami’s chances for the prize has become a collective pastime when Nobel season rolls around each autumn. Love or hate Murakami’s peculiar brand of fiction, there is no doubt that a great deal of fanfare and hype will surround the next release from the literary star.